In the 1950s, a planning method was conceived called “Material Requirements Planning (or MRP).” MRP changed the world of manufacturing forever. But times have changed—customer tolerance times are much shorter, product variety and complexity has increased, and supply chains have spread around the world. MRP is dramatically failing in this “New Normal.” Demand Driven Material Requirements Planning (DDMRP) is a practical, proven, and emerging method for supply chain planning and execution that effectively brings the 1950s concept into the modern era. The foundation of DDMRP is based upon the connection between the creation, protection, and acceleration of the flow of relevant materials and information to drive returns on asset performance. Using an innovative multi-echelon “Position, Protect, and Pull” methodology, DDMRP helps plan and manage inventories and materials in today’s more complex supply scenarios, with attention being paid to ownership, the market, engineering, sales, and the supply base. This method enables a company to decouple forecast error from supply order generation and build in line to actual market requirements, and promotes better and quicker decisions and actions at the planning and execution level. DDMRP is already in use by MAJOR Global 1000 companies. 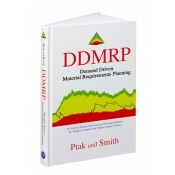 Demand Driven Material Requirements Planning is THE definitive work on DDMRP, and will be required as courseware for all those taking the Certified Demand Driven Planner (CDDP) Program. THE authoritative work on the emerging DDMRP methodology. Provides a clear, concise, and compelling explanation of the breakdown of conventional planning systems. Includes immersive and extensive examples that bring DDMRP to life across multiple industries, including vertically integrated supply chains, fast-moving consumer goods (FMCG), heavy fabrication and assembly, and retail and wholesale distribution. Features over 300 graphical figures. Ptak and Smith are world renowned leaders in the fields of MRP, Theory of Contraints (TOC), Quality Improvement, and Supply Chain Management. "This book is the ultimate reference for this new way of life across a dynamic adaptive supply chain."